As race fees continue to go up, one needn’t search far to find someone with an opinion on the matter. From Runner’s World to the blogosphere to the regulars of my weekly group run, people are talkin’ about it and sometimes it gets FEISTY! 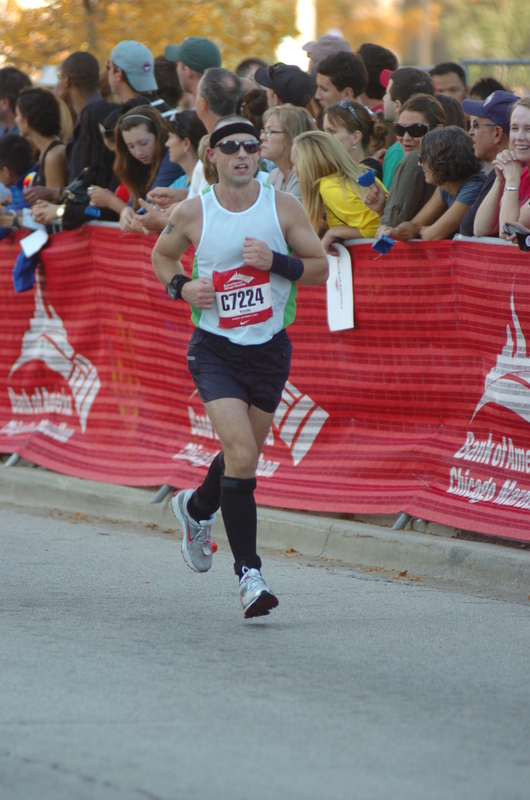 Earlier this month, I signed up for the now sold out 2012 Chicago Marathon. I was so paranoid of missing entry that I registered THE EXACT MINUTE registration opened. I whizzed through the many pages of sign-up and when it came to pay the $150 registration fee (up $5 from 2011), I didn’t even flinch. I would’ve paid $300 to run the Chicago Marathon. Any more than that and I’d have to seriously check my budget, but to me, every single penny of that $150 is well beyond worth it. I’m a dreamer. I love to picture myself doing extraordinary things. But reality is an asskicker. I will never take a pitch in the Big Leagues. I will never drive the lane or shoot a game-tying three in the NBA. The NFL will never see my touchdown dance. But on October 7, 2012, I will take to 26.2 miles of my home city like a rock star, running at top speed, supported by the voracious cheers of the million plus spectators lining the streets with their bodies and their roars. The entire city will stop for me. I will be on top of my universe. I will never get that feeling at the St. Louis Marathon. Or the Houston Marathon. Or any marathon that isn’t a World Major, or at least treated as such. If one hasn’t had this experience, he or she will have a hard time understanding it, but trust me: it’s definitely worth $150. And that’s cool too. Some folks have a dollar per mile limit, like they won’t pay more than $3 a mile, so no more than $78 for a marathon. That’s totally cool. You can run the St. Louis Marathon for that. But it’s lonely. You won’t feel like a rock star (unless you win it maybe). And you’re in… St. Louis. I would pay $78 for that kind of experience too. This entry was posted on February 12, 2012 by therunfactoryblog. It was filed under Philosophy and was tagged with Chicago Marathon, Half Marathon, Marathon, Philosophy, Ultrarunning. I like your defense of the high price. I agree that at some point, the crowds and spectacle do justify or explain the triple-digit we have to shell out to run some of these prestigious races. But moving forward, I will only shell out the big bucks for the Marathon Majors and Disney races. $135 for a Rock ‘n Roll race? No thanks. See you in Louisville — I’m doing the half, but still, same atmosphere. Sweet! The Derby Marathon and Half is a great event. I’m going to take my time and treat it as a training run for IAT50 this year. I have yet to just take my time through a road marathon so I’m looking forward to it! As for the RnR series, I’m in total agreement. I wouldn’t pay $100 or more for a Half like they charge, but I do know people who like them and are willing to pay for all those “extras”. So I can’t knock ’em for it. I have had fun volunteering at the RnR races though. They treat their volunteers very well! It’s interesting. Because people are willing to pay that much money for sports or concert tickets, which I would argue are much less thrilling in the sense that they’re spectator events. Being involved ups the ante. I love going to a basketball or baseball game, but would I pay hundreds of dollars for most sporting events? Nope. Would I pay that much to run a race? Most of the time. I’ve been thinking about it. I keep saying I’ll run another half first, but people keep telling me I might as run a full. I agree with your stance on the high-priced events. Most people I know don’t flinch at blowing $100+ on a night out on the town (that in all likelihood, they will not remember), tickets to a sporting event as a spectator, on a new Apple device, etc. I’ve run the Chicago Marathon five times, I’ve run the Louisville Marathon twice, the St. Louis Marathon three times, and about eight more “smaller city” marathons along the way. You’re right, there is something about running Chicago. It’s euphoric. It’s multicultural. It’s simply an amazing experience. But, with that said, there is something breathtaking about running a marathon with less supporters in less aethesically pleasing cities. It tests you as a runner; makes you question your dedication, commitment (makes your friends and family question you too!) and I see value in running the second-tier marathons because that’s where grit, mental labor, and second guessing pull you through. Jon, you’re totally right that the smaller event is more taxing on the brain, which could be desired for sure. As long as the runner knows what type of event he/she is paying for and is cool with it, I don’t see any problems there.